Japanese Episode 268: "Meganiumu VS Fushigidane! Kusa Taipu no Iji!" English Episode 606: "Tie One On!" Satoshi's next opponent has been chosen, and it's Jun'ichi from Wakaba Town! After watching Jun'ichi lose to Moé in a tournament battle, Satoshi meets the young trainer in the League's Pokemon Center. As the two get to know one another, Satoshi's Fushidane and Zenigame get into a quarrel with Jun'ichi's Meganium and Marilli. The fight is broken up, but a rivalry between Satoshi's Fushigidane and Jun'ichi's Meganium is ignited. Before too long, Satoshi's and Jun'ichi's League battle commences. Jun'ichi's Marilli is able to put up a good fight against Satoshi's Pikachu, but the electric-type eventually wins out. Next up is Jun'ichi's specially-colored Reacoil! Jun'ichi's pokemon is able to win this time, using a combination of Thunder Wave and Tri-Attack to knock Pikachu out. Next, Satoshi calls on his Hinoarashi, but his fire-type falls prey to the same strategy used against Pikachu and quickly loses. Satoshi's final pokemon, Fushigidane, is able to use its vines to manuever around well enough to beat Jun'ichi's Reacoil. Now it's Jun'ichi's turn to call on his final pokemon--it's Meganium! 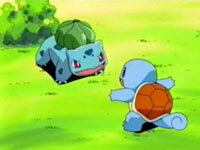 The two grass types battle it out for a while, and neither pokemon seems to have the upper edge. After enduring an onslaught of attacks, both Fushigidane and Meganium are knocked out, ending the battle in a draw. With one win and one draw, Satoshi has earned four points altogether, enabling him to move past the preliminaries! His next opponent? Shigeru! So here we are, the episode that introduces Jun'ichi. Of course, Japanese viewers already knew who Jun'ichi was because he was one of the main characters in the Raikou TV Special, but for American viewers, this episode was their first exposure to the character. This episode also marks the TV series debut of Kenta and Marina. Sure, they're only referred to verbally, but that has to count for something, doesn't it? There are people out there who refuse to believe that Yoshi is Kenta's dubbed name and that Dani is Marina's dubbed name. I think that people think that the names are really sucky, and so they're trying to come up with excuses for why these atrocious names can't possibly belong to Kenta and Marina. They argue that "Yoshi" and "Dani" could be anybody, and that it's impossible to determine who Jackson was giving a shout-out to at the beginning of the episode. However, there really isn't anyone else whom he would be saying hi to, and the line in the dub ("Hi Dani! Hi Yoshi! I'm on TV!") corresponds with the line in the Japanese version in which he says hi to Kenta and Marina. Sorry, fans, but it looks like Dani and Yoshi will be the names we'll be hearing if the Raikou special is ever dubbed. The episode itself was pretty good, and it's nice to see Jun'ichi as a skilled trainer instead of the hopeless loser pining for Marina we saw in the Raikou special. I didn't feel that there were any cheap victories on either side, which is a rarity in this league. Meganium's voice was dubbed over, which makes no sense considering the pokemon has the same name in both versions. Professor Elm: "How's your family?" Jackson: "They're doing great...I think. Well, I haven't talked to them in a while." Elm: "It's understandable you're wanting to focus only on the tournament right now, but your family always loves hearing from you." Jackson: "You're right Professor Elm, I'll keep it in mind!" In the Japanese version, Utsugi-Hakase asks Jun'ichi if he's heard from Kenta and Marina. He responds by telling him that Marina is doing well, but that he hasn't talked to Kenta in a while. Utsugi-Hakase tells him that he needs to keep in contact with his friends, and Jun'ichi says that he'll try to meet up with him when he returns. (For those of you who don't know, Kenta, Marina, and Jun'ichi all went their separate ways at the end of the Raikou special). Unfortunately, there are some people who believe that Professor Elm is somehow related to Jackson because of this conversation in the dub. There's nothing in the original Japanese dialogue linking Jun'ichi to Utsugi-Hakase like that. Jackson: "Hey there, Mom! I'm on TV!" [makes peace sign]. Originally he was saying "Hi" to Marina. When Fushigidane and Meganium are slapping each other around with their Vine Whip attacks, the two horizontal hits to each other are cut from the dub. I guess showing two slaps is alright, but showing four slaps is taboo. Whatever. Two seconds are cut right after the final commercial break.